The physics of roller coasters is both complex and simple, but without the influence of this branch of science, these amazing amusement rides wouldn't move an inch. Physics is the study of matter and energy and how different forces from each interact with and influence one another. From gravity to acceleration to friction, physics is the key science behind the successful operation of all roller coasters. Whether a ride is a simple kiddie coaster or an elaborate scream machine, they must all follow the same physics principles for safe, efficient operation. Gravitation: Gravity is the force that draws all objects toward the Earth's center and is the single most important physics concept related to roller coasters. In essence, once a roller coaster disengages from the initial chain lift or propulsion force, gravity ensures that it completes its course along the track. Gravity is also felt by riders in terms of both positive and negative forces that seem to push riders deeper into their seats or pull them up out of them, an exciting sensation that many thrill seekers relish. Potential Energy and Kinetic Energy: These two related concepts govern the changes in a coaster's speed and height. Simply put, the higher an object is off the ground, the more potential energy it has - that is, potential to gain speed as it falls. As it falls toward the ground, that potential energy changes to kinetic energy, or energy of motion. The sum of the two types of energy is constant, but a roller coaster must maintain an adequate balance of potential and kinetic energies to deliver a thrilling ride. Acceleration: Frequently confused with speed, acceleration is actually a change in velocity - which can be a change either in speed or direction. 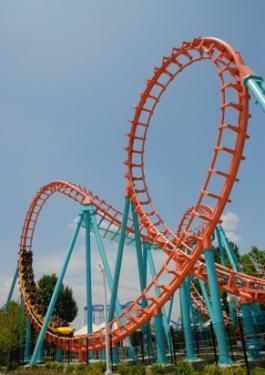 Therefore, a roller coaster is accelerating through loops and curves even if its speed remains constant. Friction: Physics formulas and calculations must include friction as a key factor for roller coasters, because friction is a force that can significantly slow a ride. Contact between the train and the air and between the wheels and the track all impose friction on the ride. In addition to these key principles for the physics of roller coasters, other physics concepts also affect how coasters operate and are equally critical for a safe, fun ride. Pressure: Many roller coaster braking systems are operated by air pressure, and that pressure must be sufficient to stop both empty and loaded trains without injuring passengers or exerting too much stress on the ride structure. Optics: Optical sensors help computer systems control where the ride is and how it is operating. Magnetism: Many high tech rides use electromagnets either as a form of propulsion or braking, and the magnets must be precisely timed and calibrated for safe operation. Electricity: Proper electricity is vital to roller coasters, from actually running the ride to powering the lights that decorate it. Biology: How the stresses of the ride will affect riders is a major factor in whether or not the ride is enjoyable or painful. A very poorly designed ride can even lead to blackouts, headaches, and other injuries. Geology: Modern steel roller coasters weigh hundreds of tons, and an acute understanding of the park's geology is necessary to position the coaster on a stable, supportive surface. Cedar Point is an example of a park that must pay particular attention to this, as its seventeen roller coasters are positioned along a lake shore and around a swampy lagoon. Climatology: The climate a ride is built in can greatly affect the types of materials used for its construction. Psychology: How a ride is named, decorated, and promoted requires a detailed understanding of psychology to attract riders. Because there are so many scientific concepts used to design, construct, and operate a roller coaster, many amusement parks host Physics Day events and invite local schools to test their knowledge against the park's rides. Physics teachers may require students to measure speeds, angles, velocity, acceleration, and other roller coaster facts in order to answer questions, while some parks offer competitions for aspiring roller coaster engineers to design their own rides and build models. This can be a fun and educational event for physics students from elementary school to college levels. 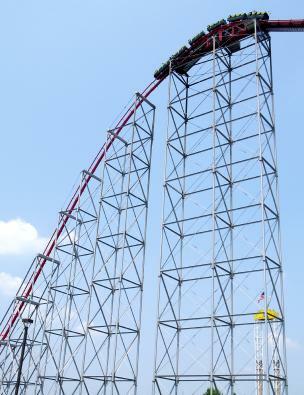 Interested in learning more about the physics of roller coasters? Try the online Funderstanding Roller Coaster, where you can adjust the sizes of hills, vertical loops, friction and gravity forces, train masses and other factors to see physics concepts in action.